MG over at the blog Chasing Mailboxes D.C. has issued a winter utility cycling challenge: The Errandonnee. Participants must complete 12 cycling errands within 12 days and ride at least 30 miles while doing so. Documentation of the errands is required, including photos and a randonneuring inspired (could you tell from the term Errandonnee?) control card. Errands fall into 11 categories of which you must complete at least 7, using each category no more than twice. For more details on the rules of the challenge, check out this post. This seems a natural for me as I’m pretty much in pure errand mode these days. I haven’t been on a purely recreational ride since my New Year’s Day Bridge Ride. It should put a bit of fun in my daily pedaling around the city. I don’t normally work Saturdays but we’re swamped right now. I’d agreed to go in and open the shop so that myself and two other employees could clock some overtime and chip away at the backlog for a few hours in the morning. This past week I’ve been enjoying the lengthening days and some beautiful sunrises on my morning commute. Today, however, I was going in an hour earlier than normal so it was back to commuting in the dark.This was useful for the purposes of the Errandonee, as two of the errands must take place during the hours of darkness. The pre-dawn temperature was a balmy 3°C, a pleasant change from the statistical average low of -16°C for this date. 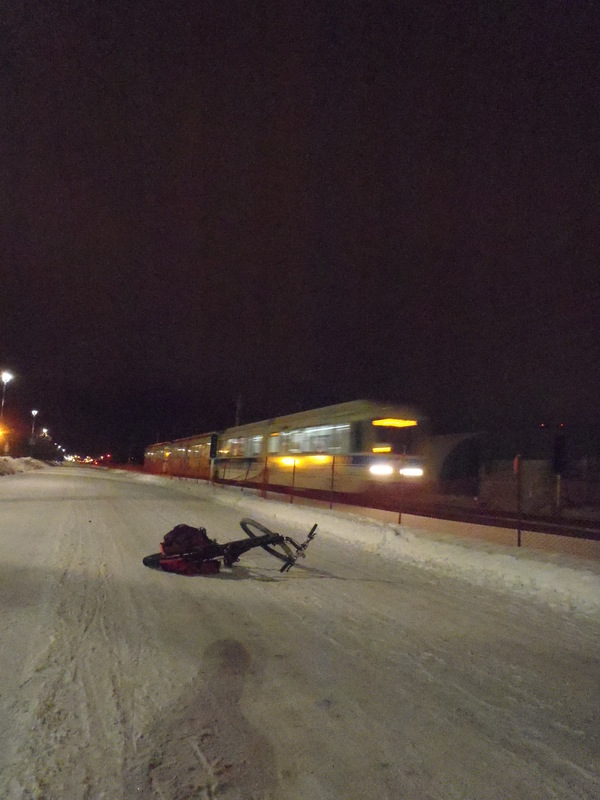 Riding the well cleared path beside the LRT tracks. A nearly empty train passing. Skirting the edge of the downtown core. 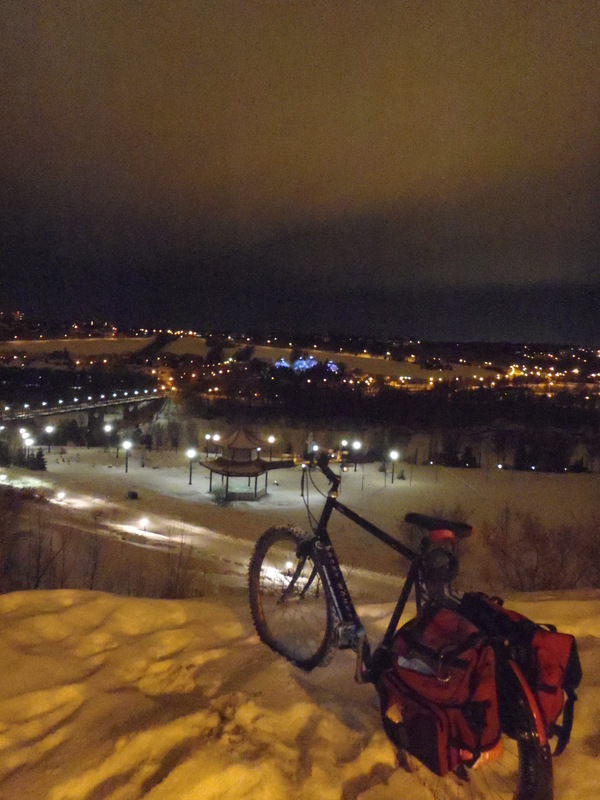 I detoured a little to get a picture overlooking the river valley. The trail down to the bridge seen on the left side of the photo was a fun, fast ride and I was pleased to see that it was well plowed and maintained. 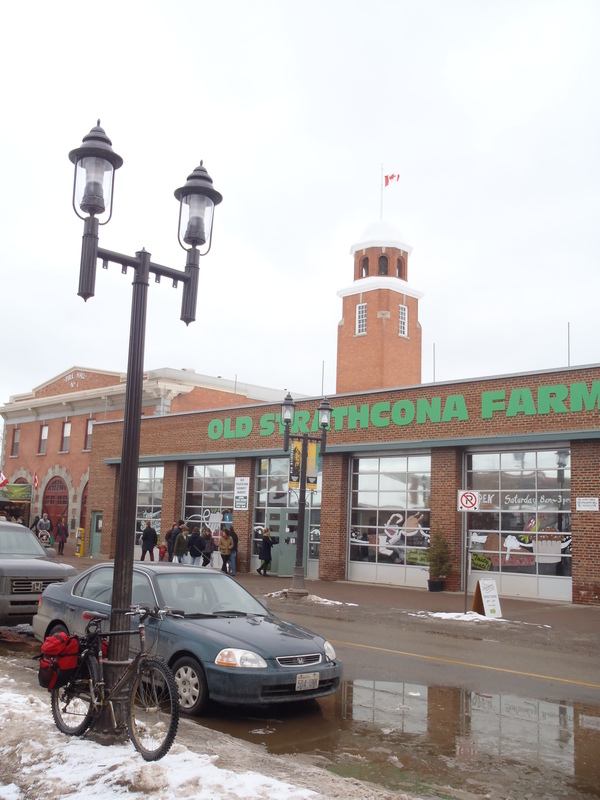 We called it a day at noon and after locking up the shop I headed off to the Strathcona Farmer’s Market to pick up some groceries for the coming week. I had noted in my last blog post that the Market wasn’t doing a great job of keeping the bike racks clear. 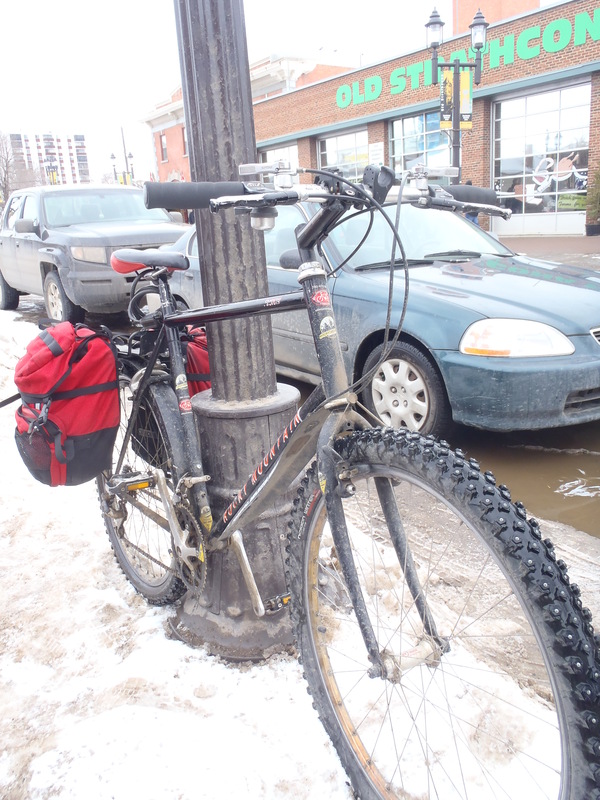 Today the bike racks were so snow covered as to be unusable so I locked up to a lamp post. 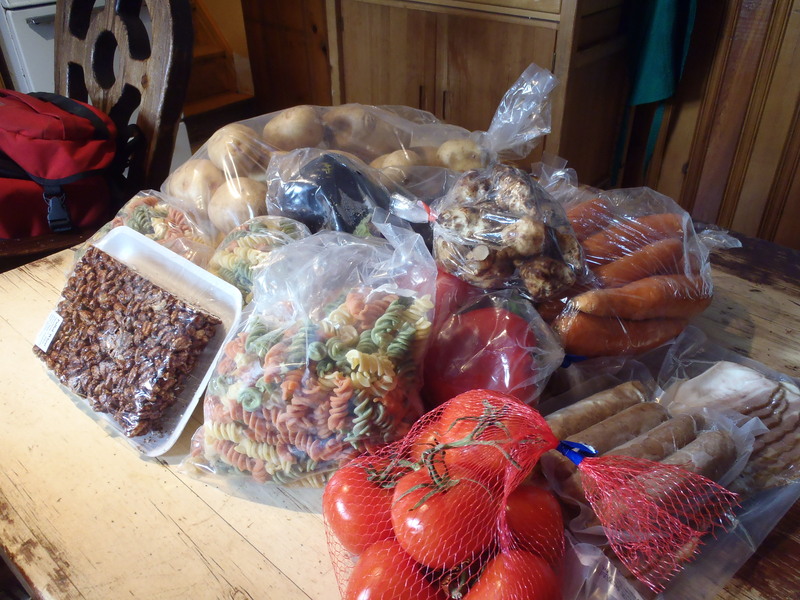 After a quick trip through the market my panniers were well filled (and heavy) with food. Onwards to the last errand of the day. Slushy Saturday at the Farmer’s Market. Just a little closeup pic of the winter bike. Since Bikeworks North opened in my neighbourhood early last year I haven’t got down to the south shop very often. As I was in the area, I zipped over to say hello to the south volunteers and rummage through the used parts room for any handy odds & ends. After having been shut down for a week because of a water problem elsewhere in the building, there were a gaggle of volunteers in the shop. I found a couple of items I could use and headed home. 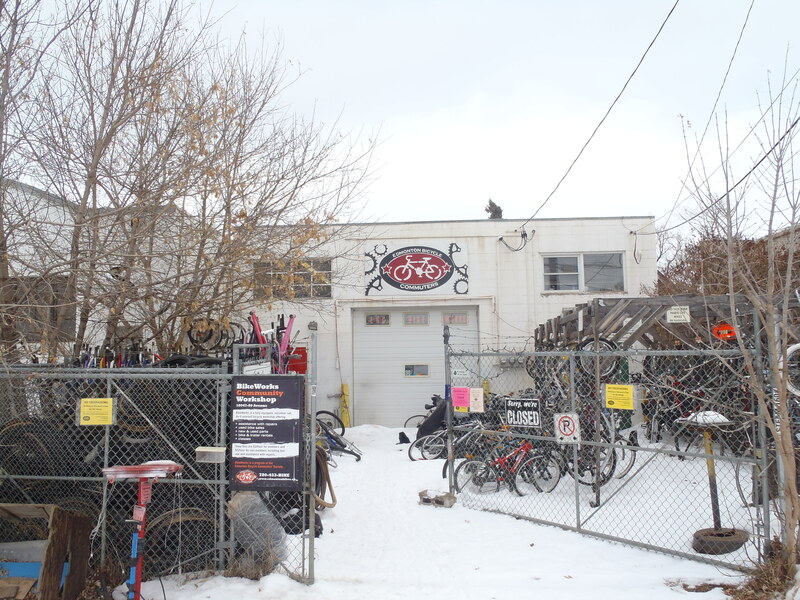 BikeWorks, the community bike shop operated by the Edmonton Bicycle Commuters’ Society. 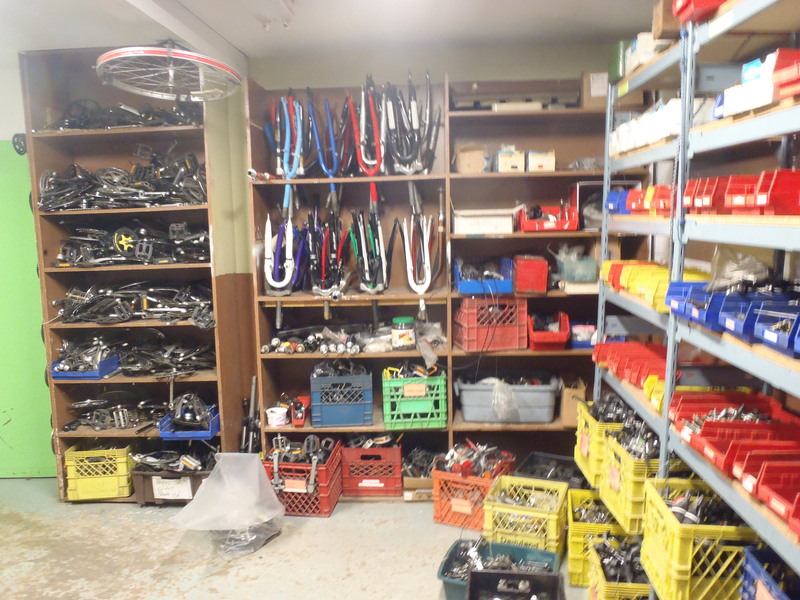 Piles of parts to keep the bikes of Edmonton commuters on the road. 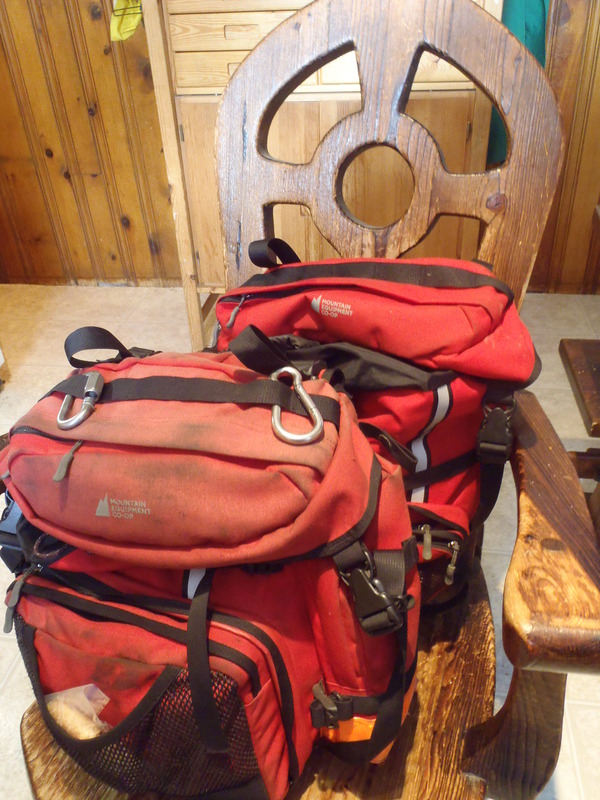 There was still a little room left in my well worn 56L MEC pannier set. 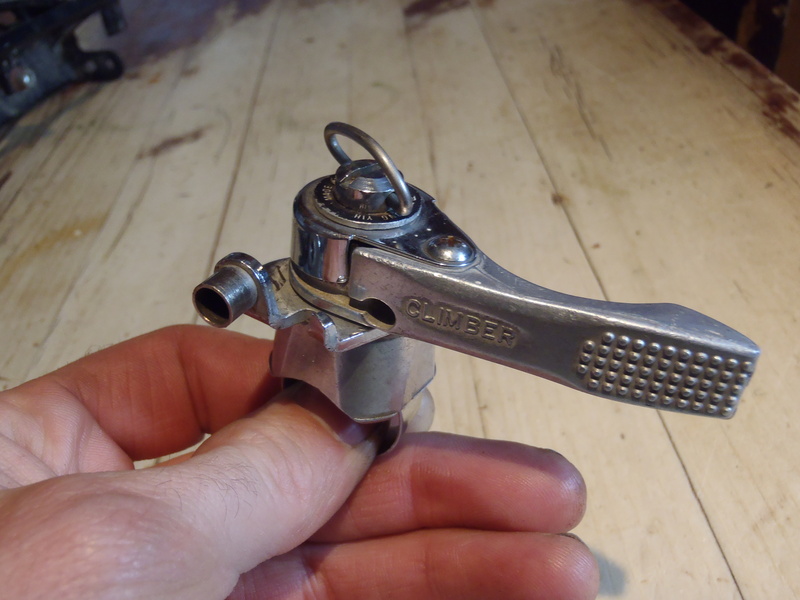 This ratcheting friction shifter appears to be a copy of the old Suntour ones I have on my winter bike. I love those shifters and hopefully this’ll be a good spare. I’m building up a MTB from an abandoned frame that I found last spring. Apparently it’s almost impossible for me to build a bike without putting a rack on it. This solidly built aluminum seatpost rack should do the trick. It also has a sturdy quick release mounting clamp so I can remove it without much problem if want. 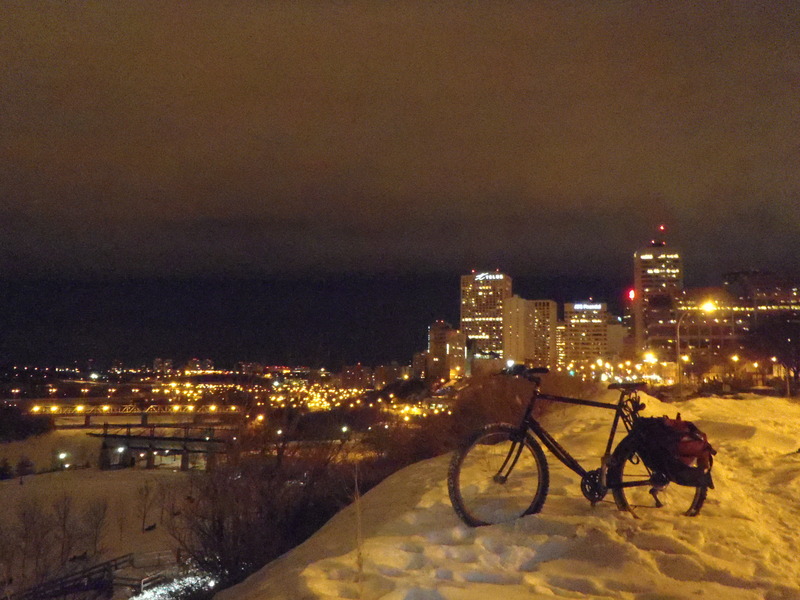 This entry was posted in commuting, Cycling, Utility Cycling, winter cycling and tagged Bicycle, Bike, commuting, cycling, Edmonton, errandonnee, Snow, utility cycling, Winter, winter cycling by tuckamoredew. Bookmark the permalink. 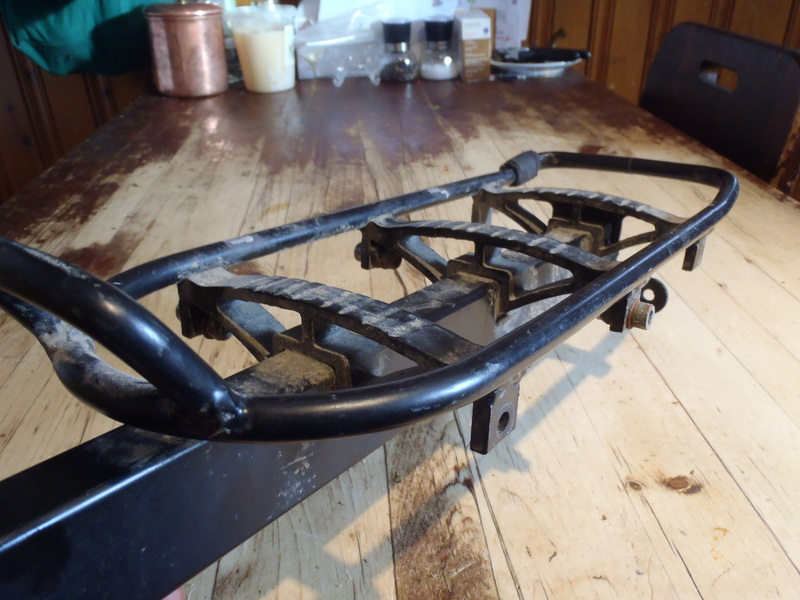 Are these your home made snow tyre spikes? No, those are commercially made ones that I picked up back in December second hand for a great price. This particular model is monstrously expensive new so used is the only way I’d buy them. They were in like-new condition. They are aggressively studded (about 300 carbide studs per tire) and are intended for winter off-road riding. Since that’s what many of the roads are like around here they are working great. Not at all speedy on bare asphalt, though. Very cool post! What an adventure!! Thanks! It was a fgood day. Pingback: Errandonnee Musings: If One Errandeurs, But No One Blogs It… | chasing mailboxes d.c.